Submitted by Alexander Briones on Apr. 11, 2018. Originally published on Feb. 4, 2016 and last updated on Apr. 12, 2018. When mixing, you need to hear your recorded tracks exactly how they sound, warts and all. And this is what good studio monitors do, they reproduce sound transparently, so you can make honest assessments and adjust accordingly. Here we present you with the highest rated studio monitors in the sub $500 price range, updated for 2018. This is where you'll find highly rated studio monitors that are ideal for any home studio. Some of these are bigger and bulkier so they require more space, but they allow for more people to hear your mix, great for impressing friends and clients. There are also compact reference monitors from premium brands included, and they are ideal for small home/room studios. If you want to, you can skip ahead to the Under $300 section or the Under $200 section. 95 out of 100. Incorporating 450+ ratings and reviews. 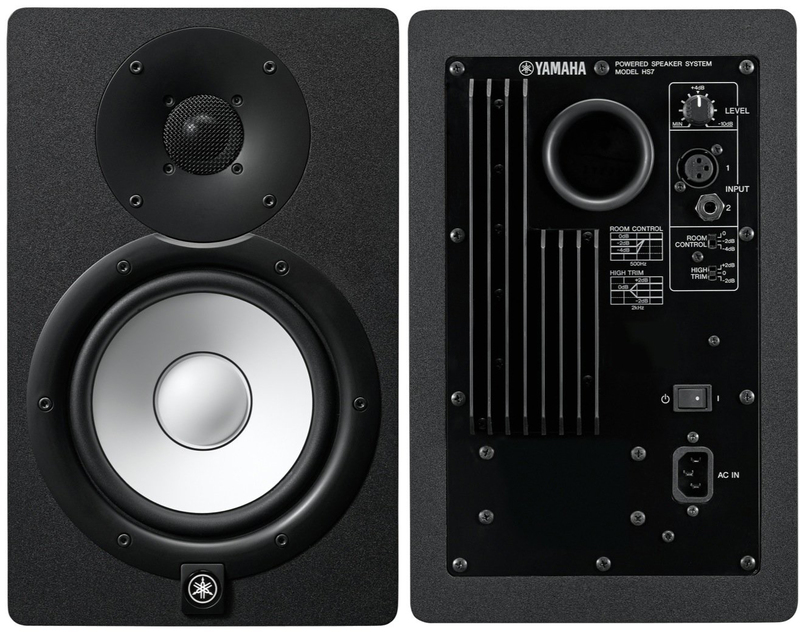 Thanks to the success of the now legendary NS10 studio monitor, Yamaha continues to enjoy a favorable position in the near field monitoring market. As proof, they have secured multiple recommendations in this guide due to the high ratings their monitors get. The bigger 8" woofer allows for more headroom and low end response, while the room and high-trim controls will let you adjust the sound to fit into different studio sizes. There's nothing really special when you look at the spec sheet, but Yamaha was able to make all the usual parts click together - resulting in outstanding monitoring experience that's reflected by its high ratings and expert recommendations. It also helps that the HS8 is relatively affordable, you'll have enough spare to buy other important studio gear. Dimensions: 9.8" x 15.4" x 13.1"
Accurate and reliable are two prominent descriptions that people use to describe the Yamaha HS8. Compared to their previous affordable monitors, many found the improvement to be dramatic. While those who have more expensive monitors are perplexed as to how close the HS8 is, in terms of quality. Other commendations point to its value for money and longevity. There are a few users who complain of interference from other devices. Some also find that it lacks low end, especially for bass heavy musical styles. The Yamaha HS8 is a good safe middle ground for those who want quality, reliability and versatility. A cool looking white finish Yamaha HS8 version is also available at Amazon. 92 out of 100. Incorporating 30+ ratings and reviews. 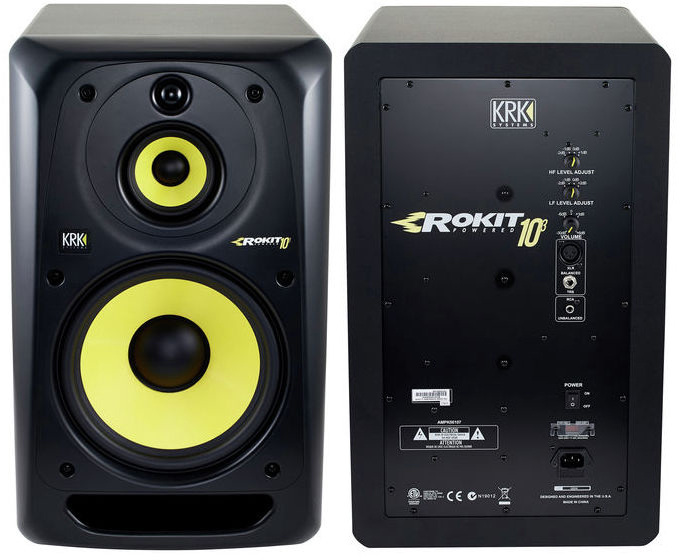 The KRK Rokit 10 G3 is a loud three-way active studio monitor that features a 148W 3-way amp, a drives a big 10" aramid glass composite woofer, a 4" mid frequency driver, and a 1" dome tweeter. The bigger woofer and the front firing port makes this studio monitor ideal for mixing bass heavy, and to do so at louder volumes. The dedicated mid frequency driver prevents the bottom end from muddying the mids, and it is mounted on a flexible module for easier positioning. With its three drivers and bigger cabinet, expect the KRK Rokit 10 G3 to take a bit more space, and to be heavy. Wrapping up its features is its distinct yellow colored woofer, which is KRK's signature feature, as seen in many home studios. Dimensions: 14.4" x 12.8" x 21.5"
Most of those who rate the Rokit 10 G3 highly find its overall performance to be impressive and reliable. A good number of users are very pleased with its low-end and mid-range response. Value for money also came up a number of times. There are a few users who find the bass frequencies to be a bit too heavy. Some experts cautioned that the volume levels of this monitor may be too much for small listening/mixing spaces, but then again you can simply dial the volume down. If you're looking to fill your studio space, or if you're working with DJ, EDM and other bass heavy styles of music, then the Rokit 10 G3 is for you. 93 out of 100. Incorporating 60+ ratings and reviews. Known for their premium studio monitors and speakers, Focal have successfully expanded into the mid-tier market with the Alpha 80. It doesn't stray too much from conventional designs, with its 140 Watt amplifier (Bi-amp), 8" woofer and 1" tweeter - but it implements all these with their brand of quality materials and premium build, something that you usually have to pay top dollars for. Finally, the Alpha 80 comes with automatic standby mode, an energy-saving feature that turns off the monitor after 30 minutes of idle time. Dimensions: 15.6" x 11.3" x 13.7"
Superb and incredible are just two of the many positive adjectives that people use to describe the Focal Alpha 80. Even experienced users find the sound to be crystal clear, and are happy with its volume and low end. Satisfied users come from various musical disciplines, including drummers, electronic musicians, DJs and more. Because of its inherent loudness, it can be tricky to use the Focal Alpha 80 for tight studio spaces. There are also a few who noted that the bottom end can be a bit too much for mastering use. 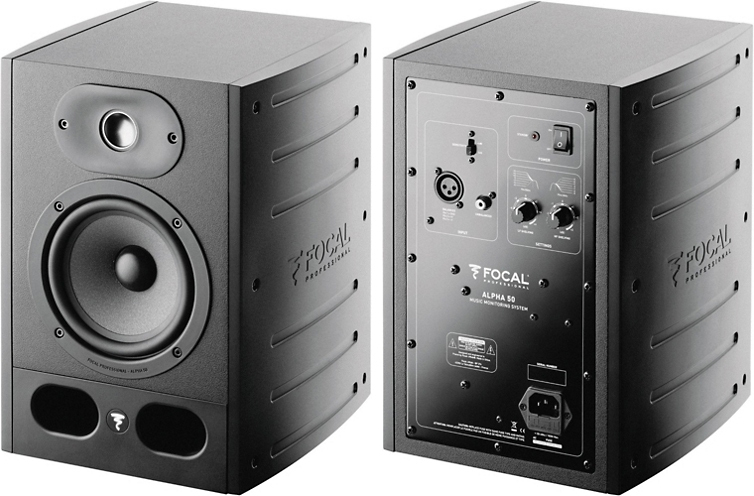 The Focal Alpha 80's good bottom end, and overall clarity makes it very easy to recommend. 95 out of 100. Incorporating 20+ ratings and reviews. Just one look at the PreSonus Sceptre S6 and you'll notice its standout coaxial design, where the 1" tweeter is positioned at the front of 6.5" woofer. Compared to traditional 2-way speakers where the two are separated, this back-to-back configuration allows for a more balanced dispersion. To better utilize this design, PreSonus equipped the Sceptre S6 with a dual-core DSP that handles crossover frequency adjustments. The 180W class D amplifier features an internal heat sink for longevity and performance. Controls include level adjustment knob, and pre-programmed "acoustic tuning" buttons that let you customize the resulting sound to match the room that you are using it in. 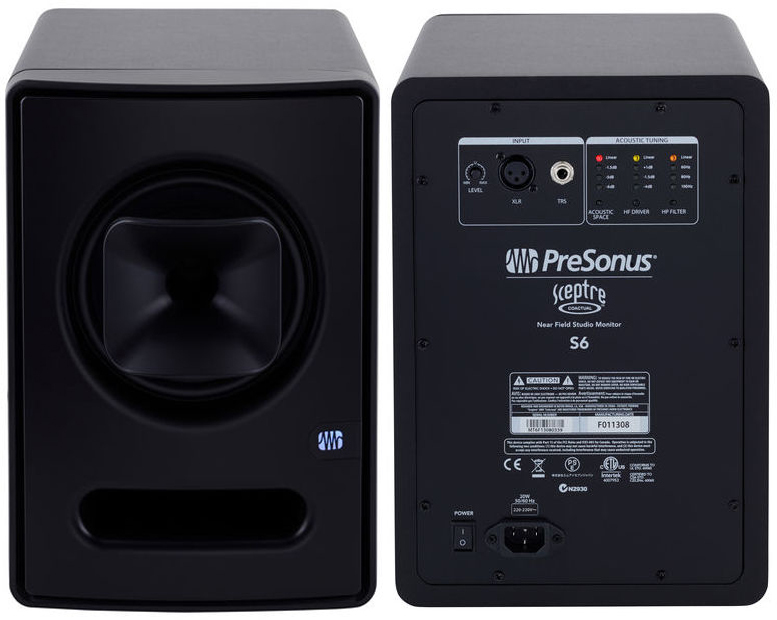 Dimensions: 13.2" x 9" x 12.2"
Experts and users alike have mostly great things to say about the PreSonus Sceptre S6, with specific emphasis to its mid-range clarity and overall sound quality. Even those who are skeptical with the coaxial design report that it improved their monitoring/mixing experience. There are a few who wanted knobs instead of buttons for the acoustic tuning controls. There are also some experts who noticed subtle smearing in the lower frequencies due to its front ported design. With its clarity and sound quality, it will be hard to go wrong with the PreSonus Sceptre S6. The $200 to $300 price range features some of the best value studio monitors for home recording/production. Usually only found on the upper echelons of the market, Genelec is a brand trusted by many professionals and is used in many high-end studios. Thankfully, they have a representative in the sub $300 market, giving us the chance to experience what pros use, albeit in a smaller package. Speaking of small, this powered studio monitor houses a tiny 3" woofer and .75" tweeter, so don't expect much volume and low end from it. This is the reason why many users tend to pair it with a Studio Subwoofer. With its volume limitation aside, its midrange clarity is very useful in small home studio situations, it is also an ideal portable solution for those who want to carry a studio monitor with them. Dimensions: 7.67" x 4.76" x 4.5"
Those familiar with the bigger and more expensive Genelec monitors attest to the similarity of the smaller 8010's sonic quality. Many also commented that ear fatigue is not an issue with this speaker, thanks to its low distortion performance and its clean mids and highs. Obviously, the low end will be lacking but it can get the job done for most music types. Those who need more bass can add a studio subwoofer. 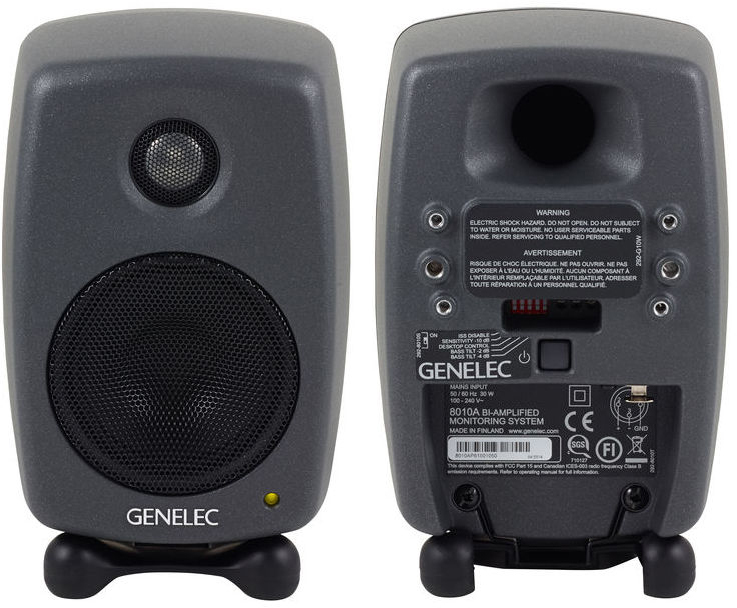 If you're looking for a portable studio monitor, or if you have a small studio space to work with, the Genelec 8010A is highly recommended. 94 out of 100. Incorporating 90+ ratings and reviews. Many professionals and experienced studio owners swear by the Focal brand, so it's not surprising for them to secure a spot in this list. While many of their products have premium price tags, the Alpha 50 makes their brand of quality more accessible. What's unique about this monitor is its low directivity design, which goes against the usual sweetspot focused design that other manufacturers follow. This means that the sound coming from its 5" woofer and 1" dome tweeter are distributed more across the room. Another cool feature of the Focal Alpha 50 is its automatic standby mode, which conveniently turns off the speaker after 30 minutes of inactivity. Dimensions: 12.3" x 8.7" 10.2"
Most of the reviews rave about the speaker's uncolored, clear, lively and balanced sound. Many describe the sound as tight yet not overbearing, and attested that this monitor helped reduce their ear fatigue when mixing long hours. Some even say that this bottom-of-the-line speaker (at least for Focal) can outclass more premium alternatives. There are a few users who recommended getting a sub woofer to get the most out of the Focal Alpha 50. While some complained about the standby mode, and wish that it can be disabled. 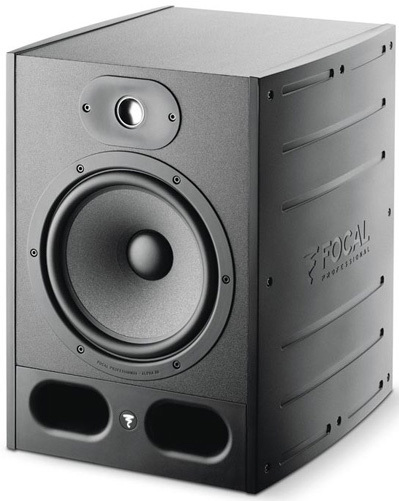 If accuracy is high on your list but you don't want to stretch your budget too much, then check out the Focal Alpha 50. 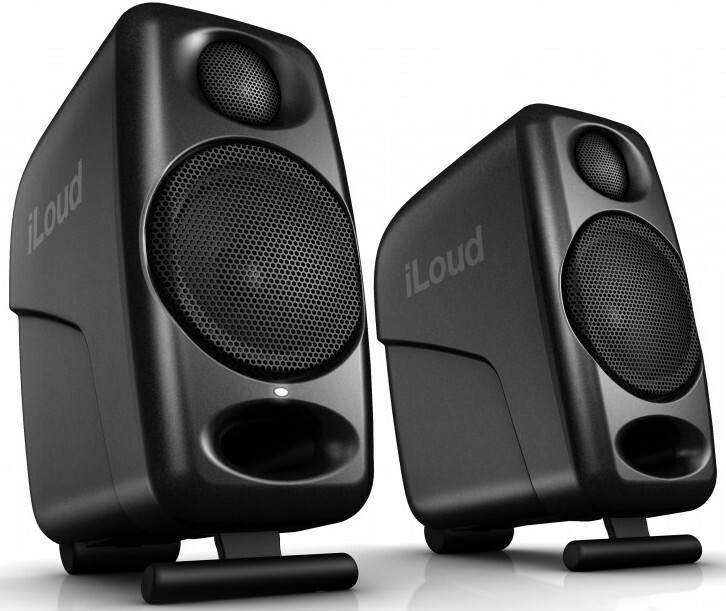 The iLoud Micro is a compact nearfield studio monitor with modern wireless connectivity via Bluetooth technology. Since it is sold as a pair, some might mistake it for a regular multi-media speaker, but know that the iLoud Micro is designed with studio monitoring clarity in mind, at a price that's very affordable. At its core is a 3" neodymium woofer and .75" silk dome tweeter, which are powered by a 25W amplifier. Finally, each speaker comes with isolation bases and adjustable angle for easier positioning. Dimensions: 7.09" x 5.31" x 3.54"
The IK Multimedia iLoud Micro continues to enjoy wide acclaim, surpassing the expectations of many users with its great balance of portability and clarity. Most users agree that it has a flat and clear sound that makes for a good mixing monitor that's ideal for small studios. Reviewers report that it works well in various scenarios, from basic vocal recording to mixing of orchestrated music. As expected, there are some who found the volume and low-end lacking, but this is to be expected given its size. There are also a few users who noted that the cabinets do not feel as solid as they would like them to be. If you're looking for a modern nearfield studio monitor for your small home studio, then definitely put this into consideration. 94 out of 100. Incorporating 800+ ratings and reviews. Yamaha continues to be the go-to brand for studio monitors in the entry to mid tier market, thanks to market leading products like the HS7. This monitor is easy to spot, with its distinct white colored cone woofers, but what truly separates it from the rest is its flat response. It has a 6.7" woofer paired with a 1" dome tweeter, both of which are especially mounted to eliminate unwanted vibration and resonance for distortion and coloration free sound. Another notable feature is the use of bigger magnets, and matching advanced magnetic circuit design. Finally, the HS7 comes with room and high-trim switches for adjusting the sound to the acoustics of your listening area. Dimensions: 13.1" x 8.3" x 11.2"
The Yamaha HS7 is well received for its flat response, which many describe as very natural sounding. The highs and mids are described as very clear and transparent while the low end is just right for most mixing/mastering scenarios. There's also quite a lot of rave about its solid build, including the feel of the knobs. There are no notable concerns about the sound, but one user is mildly annoyed by the overly bright LED light. If you want nothing less than what the market considers as the best monitor in this price range, then go for the Yamaha HS7. Here are great value reference monitors that have satisfied the needs of many. While they may not have the same quality as more expensive ones, they are more than enough to handle the needs of most home studios. With these speakers, you don't need to spend more than $400 (for a pair) to improve the quality of your recordings, saving you money for other essential studio gear. JBL takes another spot in this list with the 2nd iteration of the 305, carrying over its best features while mixing in improvements that include improved transient response and linearity, new boundary EQ controls to reduce environment induced low-frequency anomalies, and improved enclosure material (15mm MDF). At its core is JBL's 5" woofer and 1" tweeter, with a waveguide that allows for easier sweet spot positioning. Dimensions: 11.75" x 7.3" x 9.1"
The JBL 305P MKII's strong point is its sound quality, which many consider as incredible when considering its price point. Many users specifically mention its highs and midrange to be very life-like, and they report that it helped them hear nuances that they were not able to with their old monitors. The speaker's build quality also gets a lot of thumbs up. Some users complain that the low-end is lacking, but given its small 5" woofer, this is to be expected. There are also a few who note that it distorts when pushed hard, but this is more of a physical limitation than a problem. 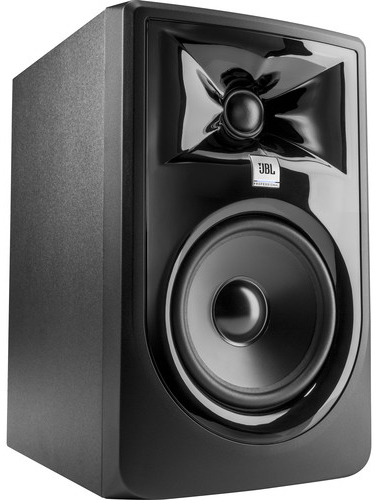 Just like its predecessor we expect the JBL 305P MkII to be among the best studio monitors in the market for a long time. 92 out of 100. Incorporating 350+ ratings and reviews. As a testament to the popularity of Yamaha's HS series of studio monitors, all three models made it to this list, including the HS5, which is the smallest of the lot, with its 5" woofer and 1" tweeter. Other than its smaller profile, it follows after its bigger siblings, making Yamaha's brand of sound and build quality more accessible for smaller studios and for those with limited budgets. The unit's Room Control feature is especially useful for this smaller member of the HS family, since it is designed for use in small (and usually enclosed) studio spaces. Dimensions: 11.2" x 6.7" x 8.7"
The Yamaha HS5 continues to get favorable reviews, mostly from home studio owners who are impressed with the improvements that it brought into their production process. Sound quality is mentioned in a positively light, along with reliability and value for money. A good number of reviewers are impressed with how flat the response is, great for mixing music that doesn't require much low frequencies. Lack of volume and punch came up a few times, while there are some who advise that you save up for the bigger HS7 or HS8, or get the matching Yamaha studio subwoofer. 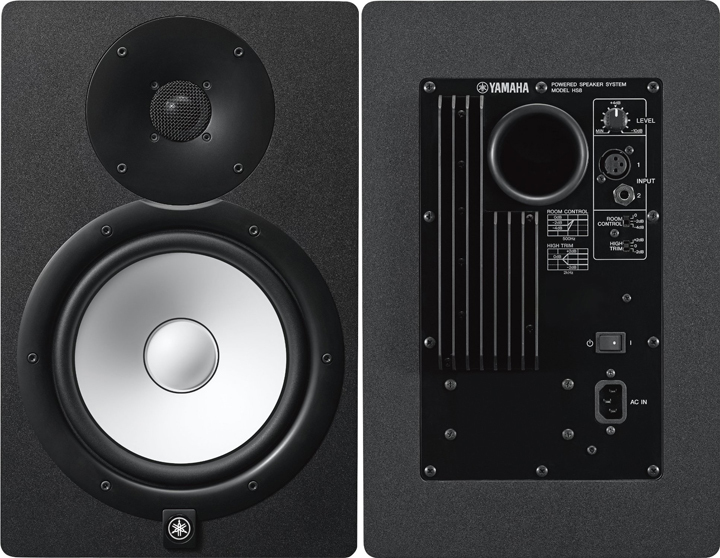 The Yamaha HS5 is highly recommended for those working with small studio space. 91 out of 100. Incorporating 450+ ratings and reviews. 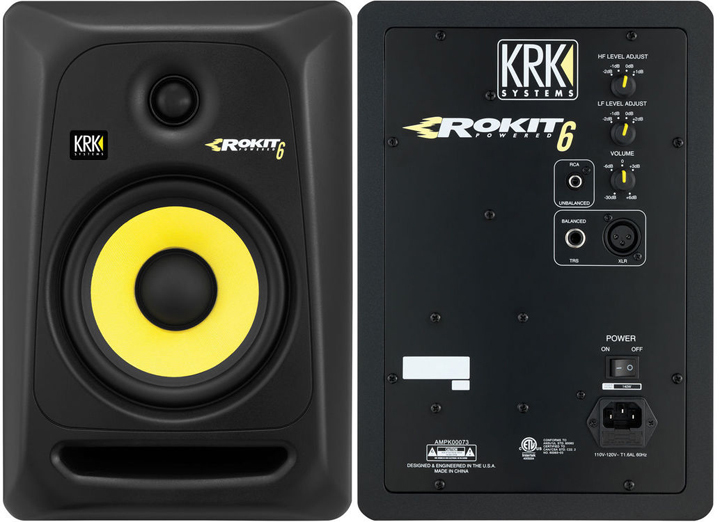 The KRK Rokit 6 G3 is the third iteration of KRK's popular studio monitor line, well known for its improved bass response. It continues to invade studios world over - you can see their unmistakable yellow woofer on many YouTube videos. The most notable feature of the Rokit 6 is its 6" Kevlar/aramid composite woofer and front firing bass port, which gives it more bass frequency response than other monitors. And because of that, you should go for something else if you want a flat response monitor. This particular model has a 6" Kevlar/aramid composite woofer, which is slightly bigger than the usual 5" configuration you see in this price range. Dimensions: 11.4" x 8.9" x 13.1"
Its combination of quality and great value have helped propel it to the top, with most reviewers giving it perfect scores. Other positive traits mentioned on reviews include durability, reliable operation, and compact design. There are a few reports of ear fatigue when used for longer periods, but adjusting the monitor positions can help alleviate this. Some users caution that the speakers are bulky, so it is imperative that you check the dimensions before buying. If you're just starting out or you're budget is limited, and you're looking for a budget friendly monitor with low frequency capabilities, then get the KRK Rokit 6 G3. If like me you're tired of the usual black color schemes used by studio monitors, check out the White finish Rokit 6 which are sold as a pairs. Featured here is a top rated studio monitor that's popularly used for low-fi and mono auditioning. While it is not meant to be a main monitor, it will make a great addition for you to gauge how the mix will sound on cheaper consumer speakers. 92 out of 100. Incorporating 60+ ratings and reviews. 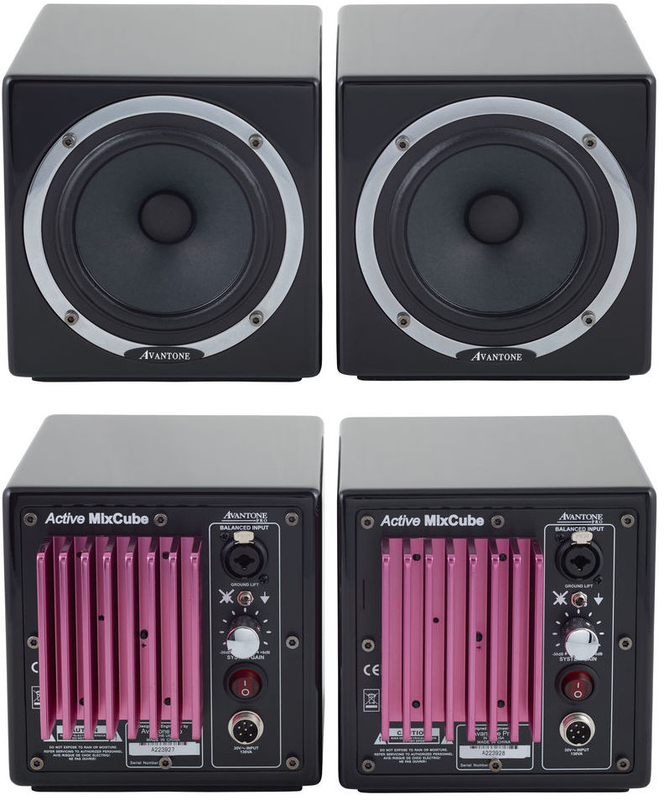 NB: At the time of publication these are currently only available from Amazon as a pair, however the Sweetwater link provides the option of buying a single monitor. The Avantone MixCube is a mini reference monitor with emphasis on the midrange, mimicking the sound of basic sound systems like those found in televisions, mobile phones, car stereos, bluetooth players, laptops and more. It sports a single 5.25" woofer, and produces sound without a tweeter, much like how most budget speakers are setup. There are no fancy controls either, so all you have to do is plug-in, get it in position and listen to your mix. Avantone assures that each unit is properly shielded so you can use it beside computers without worrying about interference. Finally, this speaker system comes in a 6.5" cube MDF cabinet that does not require much space, and it comes in black or cream color. Click here to download MixCube Frequency Response Charts. Most users consider the MixCube as the ideal monitor for mono mixing, allowing you to audition tracks as you would with real-world media players. Many users felt that it makes for easier mixing of vocals, guitars, and other instruments that sit within the middle frequencies. Experts highly recommended it as a secondary monitor to complement your studio setup. Because of its mid-heavy sound, mixing with the Avantone Pro MixCube won't have a full sound - but that's the point. There are a few who commented on the power supply being too bulky for the size of the unit, as the speaker itself is compact and light. If you keep needing to change rooms or gear just to audition your mix in lo-fi systems, then the Avantone MixCube will make a useful addition to your home studio. While most studio monitors are reasonably versatile, there's no one pair of monitors that can satisfy everybody, so you'll need to find the ones that fit your needs and resources. The best studio monitor for you will depend mostly on type of music you're producing, your studio space, and your budget. 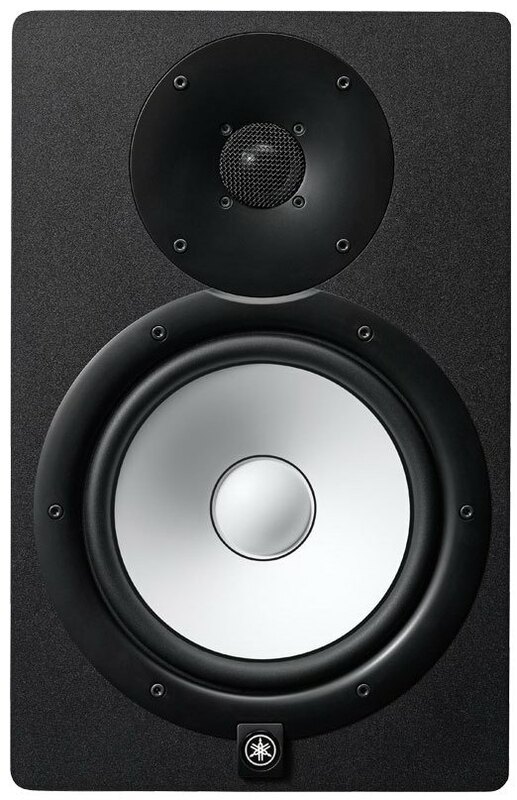 Most studio monitors have 2-way speakers where sound is divided into Low Frequencies (LF) and High frequencies (HF), and are sent to two different speakers. HF driver (also called a Tweeter) sizes are mostly the same at around 1", but there are greater variations in the size of LF drivers (also called Woofers), and this is important for you to consider. The general idea is that bigger woofers can handle more lows, while smaller ones can better represent the mid frequencies. In line with this, go for bigger woofers if you expect to mix bass-heavy songs, while smaller woofers are recommended if you put emphasis on clarity of the mids - where most of the vocals and instruments are. This specifies the range of frequencies that the monitor can handle, and is usually directly related to the size of the HF and LF Drivers. Wider frequency response can handle more types of music, but these extra frequencies can compete for your attention, which may make you miss important sonic details. If you are into mostly DJ and electronic music, you'll want bigger monitors that can handle the added low frequencies that are usually associated with these styles. On the other hand, if you'll be working with acoustic instruments and vocals, the exaggerated bass can hinder you from mixing and balancing the frequencies properly, so its best to go for flat response studio monitors. For these reasons, we highly recommend having more than one set of monitors - for you to have more sonic references to work with. The power rating of the amplifier, in conjunction with speaker size, dictates the headroom and overall loudness limit of the unit. For mixing, you want the volume to be just enough to cover your listening area, without getting it muddied or distorted. You also don't want to tire your ears easily, or disturb your neighbors - so loud is not necessarily better. Volume becomes an issue when you have someone else listening with you, or when you audition mixes that are expected to be loud - like rock and electronic music. The initial step is to look for the most popular and top rated sub $500 active studio monitors that can be easily bought from major USA based retailers. And for this 2018 update, we ended up including 32 of them on our short list, along with more than 6,500 relevant sources that include customer ratings, user/expert reviews, video reviews, forum posts and more. The Gearank algorithm then allowed us to process the data properly to give us scores that closely reflect market sentiment. Finally we divided the list into three price categories, Under $200, Under $300 and Under $500. We've also included detailed descriptions and specifications for each studio monitor, along with pros and cons derived from actual reviews. For more information about our processes see How Gearank Works. Submitted by Mitch (not verified) on Feb. 7, 2017. Interesting list of the best studio speakers. I don't normally see the Mackie HR624mk2, the PreSonus Eris E5, and a couple other monitoring speakers on other best speakers lists. Never tried the two that I've mentioned either so I don't know if they really are great. I've tried majority of the monitoring speakers on other lists, like the Rokit 5, JBL LSR 305, Adam A7X, Yamaha HS7 (my favorite), Focal Alpha 80, Genelec M030A, Focal CMS 65, etc and they're all great as well. Currently I'm using the M-Audio BX5 D2 studio monitors but I'm looking to get a new set so maybe I'll give the PreSonus Eris E5 a try. Submitted by Jason Horton on Feb. 7, 2017. I'm glad you found our guide interesting Mitch. The reason our lists of recommended gear are sometimes different to other websites is because Gearank Guides are based upon detailed statistical and sentiment analysis of customer reviews, expert reviews, and forum discussions - a process which is enhanced by our use of the Gearank Algorithm. This enables us find the gear that musicians actually rate highly themselves making us less susceptible to marketing influences than would otherwise be the case in many instances. If you'd like to know more about our methodology then please read How Gearank Works. Submitted by OJK (not verified) on Mar. 2, 2017. Take a look at the Samson Resolv series (SE6/SE8, RXA6). reference monitors with flat response at a very attractive price. Submitted by Jason Horton on Mar. 2, 2017. Thanks for the tip - we will include the Samson Resolv series of studio monitors in our data set when we next update this guide. Submitted by Jason Horton on Mar. 30, 2017. As promised, we did analyze the Samson Resolv range while we were working on the new version of this guide which was published today. Unfortunately they didn't make the cut this time around, but you can see the Samson Resolv Gearank Scores in our music gear database. Submitted by DJ ELITE (not verified) on May. 9, 2017. No Yamaha HS5? They sound the closest to the classic industry standard Yamaha NS10. Submitted by Jason Horton on Apr. 11, 2018. The Yamaha HS5's ratings have improved and as a result were included in our April 2018 updated version of this guide. Submitted by Sky (not verified) on Nov. 8, 2017. For those who are interested, if you want to avoid big dips in your response due to the comb filtering that occurs when the direct sound from high frequency driver combines with reflected sound from that same driver, try sandwiching a mirror on top of table tops or nearby flat surfaces to determine if you can see a reflection of the high frequency driver. If you can, then you need to move the loudspeakers, change the configuration of the table, or even change the angle of the table so as to eliminate the reflections. The effects of such early reflections are easy to verify by sweeping with a sine wave and observing on an RTA. Basically, if you want accurate response for mixing, you need to create a Reflection Free Zone for the mix position. Not very many people are hip to this technique, but it can really improve the accuracy of your monitoring. Submitted by Jason Horton on Apr. 12, 2018. Submitted by Юрий (not verified) on Jun. 20, 2018. And who will say anything about PRESONUS ERIS 5? Submitted by Jason Horton on Jun. 20, 2018. It was on our short-list and it had good ratings, but not quite high enough to make it into our recommended list above. Today we removed the JBL LSR308 Mark 1 from the recommended list above because it has been superseded and is no longer widely available in North America. Submitted by ngosar (not verified) on Jul. 1, 2018. I don't know if the monitor comes in pairs or single for the price shown,i mean krk rockit 6. Submitted by Jason Horton on Jul. 1, 2018. The street prices above, and the prices at both Sweetwater and Amazon, are all for a single speaker.